Plastic Spoon plays songs about money. 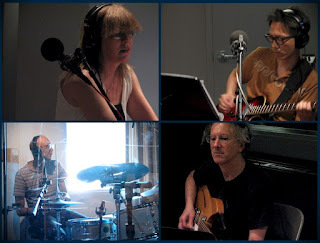 This newly-formed New York group features Karen Mantler (voice, harmonica), Kato Hideki (bass), Doug Wieselman (guitar), and Shahzad Ismaily (drums) -- great, creative musicians who've played with everybody, pushed musical boundaries, and are now experimenting with being a somewhat normal rock band. They sing a song about Karl Marx, another about billionaire David Koch, plus there's a rollicking song about paying--and not paying--the utility bill. Host David Garland welcomes Plastic Spoon to the WNYC Studio to perform and talk about their music. Lend an ear--but only one ear, because Plastic Spoon demands that their music be heard in mono!